Generally speaking, Calgary is regarded as being a conservative city -both politically and socially. But all of that changes come July when we roll out the hay bales, dust off our cowboy hats, and get down to the serious business of partying Stampede-style. 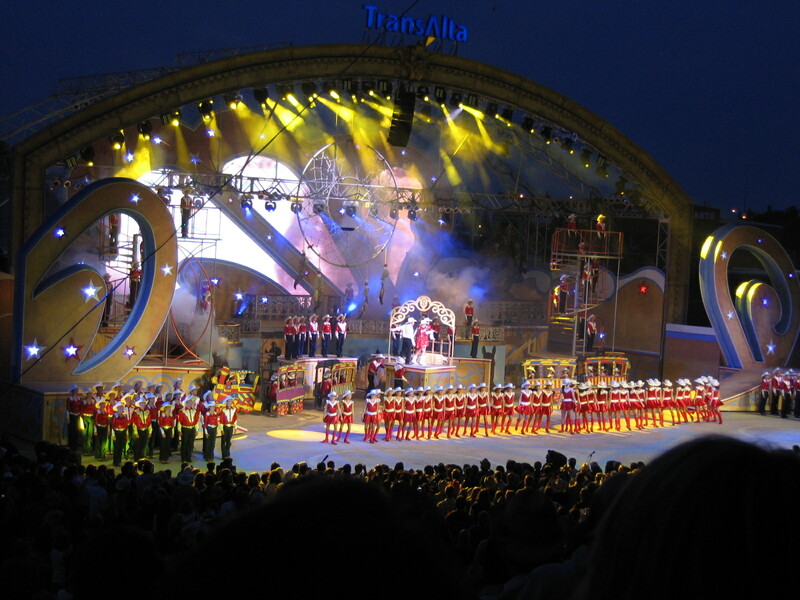 The Calgary Stampede, also known as the Greatest Outdoor Show on Earth, is a 10 day annual event that celebrates Alberta’s western heritage and pioneer spirit. 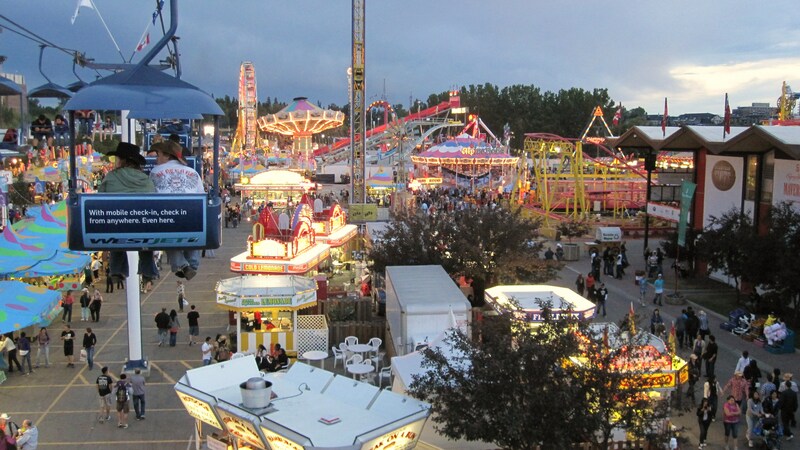 In the past 99 years, millions of people from around the globe have converged on the Stampede Grounds to take part in this world-class festival. From mini donuts and calf roping, to fireworks and line dancing, there’s something to suit everyone’s taste at the Stampede. The 100th anniversary of the Calgary Stampede will be taking place less than 100 days from now, and this year’s celebration promises to be the best one yet. As a Calgarian who looks forward to the event all year long, I thought I’d help get you into the Stampede spirit by posting 100 things you might not know about Calgary’s most beloved cultural institution. By the end of the list you should be craving mini donuts (see #86) and planning where your new five foot tall pink teddy bear will live (see #66). Yahoo! 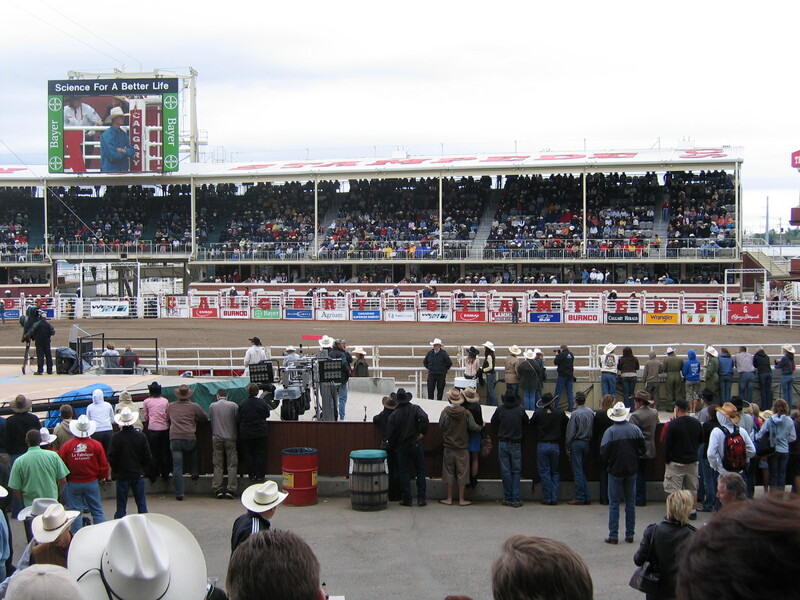 The first Calgary Stampede took place over six days in September of 1912. 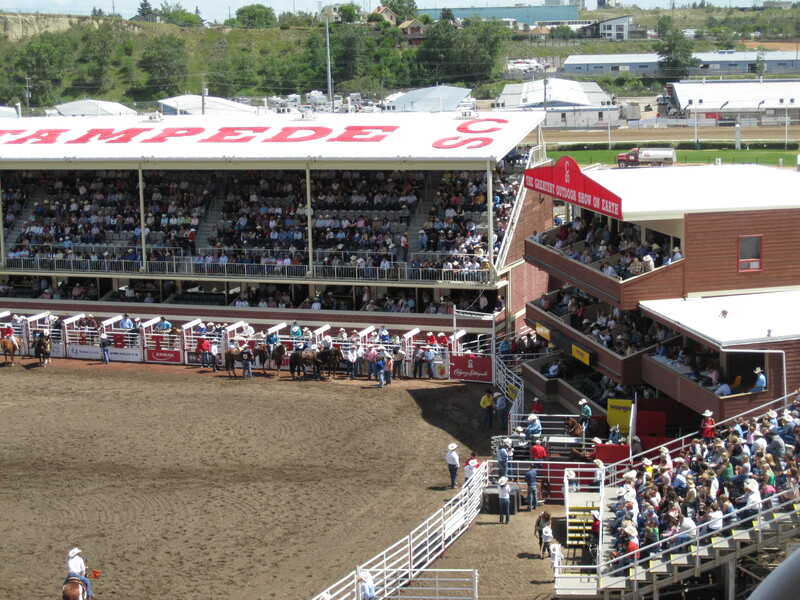 The area where the Stampede takes place is referred to as “the Grounds” by locals (it’s short for the Stampede Grounds). Over 2,000,000 mini donuts are consumed at the Stampede each year! Many famous people have served as parade marshalls over the years including Walt Disney, Prince Charles, Bob Hope, Bing Crosby, Mickey Mouse and Minnie Mouse, Lanny McDonald, and Prime Minister Pierre Trudeau. 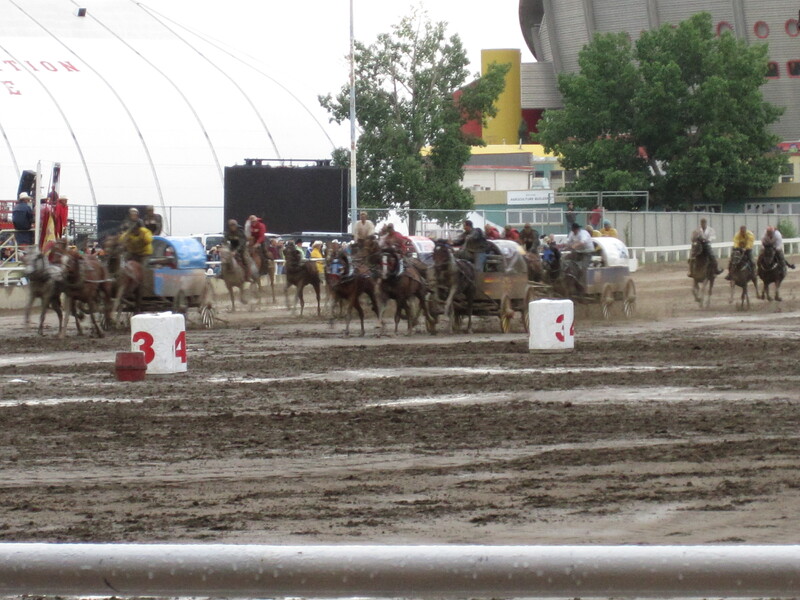 Chuckwagon racers auction off the naming rights to their tarps each year. Not only does this help fund the racers, but it’s a great advertisement opportunity for the winning bidders. 12-time Calgary champion Kelly Sutherland holds the record for the highest selling chuckwagon tarp. It was auctioned off for $300,000 in 2012. The Stampede is setting up a beach-themed area this year that features sand, tiki huts, and surfing demonstrations. If you want to dress like a local, you have to get your head into a Smithbilt cowboy hat. The birth rate in Calgary spikes each April -nine months after the Stampede. The first free Stampede pancake breakfast was held in 1923 when chuckwagon driver Jack Morton, who was camping outside the CPR train station in downtown Calgary, invited friends/Calgarians/tourists (basically anyone who walked by) to his camp for a pancake breakfast. Thus the tradition was born! Free pancake breakfasts can be found all over Calgary during Stampede week, and the local newspapers publish the times and locations. If you did a bit of planning, you could eat for free the whole 10 days! American trick roper and promoter Guy Weadick was the driving force behind the first Calgary Stampede. He continued to run the Stampede for the next 20 years. Every year the food sold on the Stampede Midway gets a little crazier. Some memorable items include the donut burger, deep-fried cola, hot dog poutine, alligator pizza, and any/everything you can imagine on a stick. Major musical groups always make an appearance at the Saddledome during Stampede week (you can see them for a fee, of course). 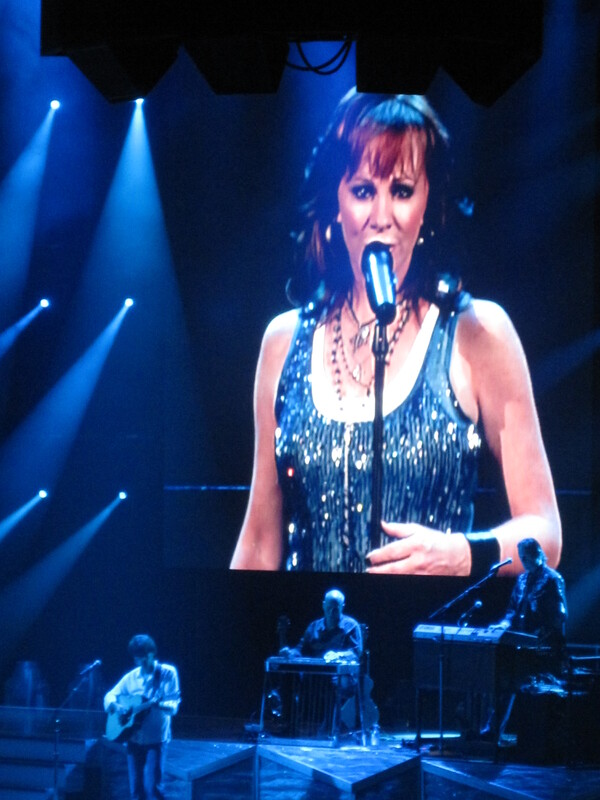 Some examples include Reba McIntyre, Garth Brooks, Taylor Swift, Katy Perry, Rod Stewart, No Doubt, and Coldplay (among tons of others). Up-and-coming musical acts put on free shows at the Coca-Cola Stage nightly, which is just inside the entrance to the Grounds. Some bands that have graced this stage include Mother Mother, Finger Eleven, Tokyo Police Club, Martina McBride, OK Go, the Trews, One Republic, Nelly Furtado, and Corb Lund. You can also find live music on the Grounds at the ever-popular bar Nashville North. But if you have any plans on getting into this hot spot, prepare to be in the doors by 11 am or you’re guaranteed to have at least a two hour wait in line. For real. Local radio stations sell backpacks on the Grounds that are full of coupons and junk food. You’ll see these bags around the city for months and months after the Stampede ends. The Stampede has its own royalty: each year one Stampede Queen, two Stampede Princesses, and one Stampede Indian Princess are elected to represent the Stampede at numerous local and international events. In downtown Calgary, Olympic Plaza is transformed into Rope Square each Stampede. From square dancing demonstrations to free concerts, it’s one of the liveliest places to catch free events off the Grounds. 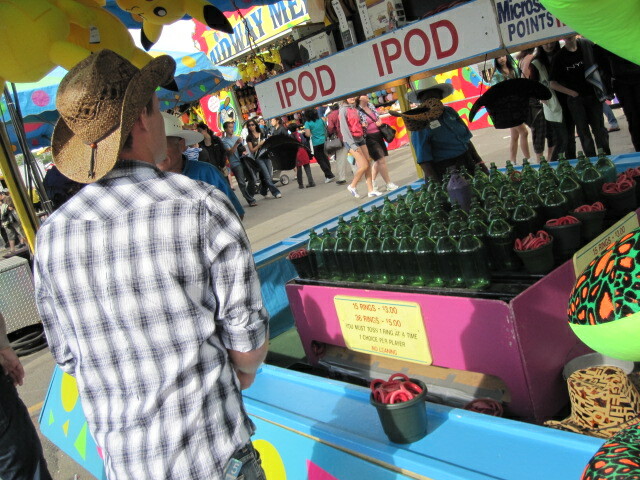 Shopping is a major part of the Stampede experience. You always know what product is the best seller because you’ll see hundreds of them walking around the Grounds (think Sham Wow type items). Huge prizes are up for grabs at the games on the Midway. It’s easy to spot the biggest spender because they’re stuck lugging around a four foot teddy bear all day. 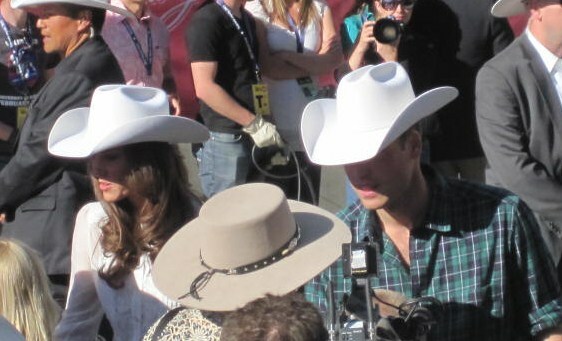 In 2011 animal rights groups urged the Duke and Duchess of Cambridge to cancel their visit to the Stampede. Instead, the couple participated in a private demonstration of rodeo and chuckwagon events. 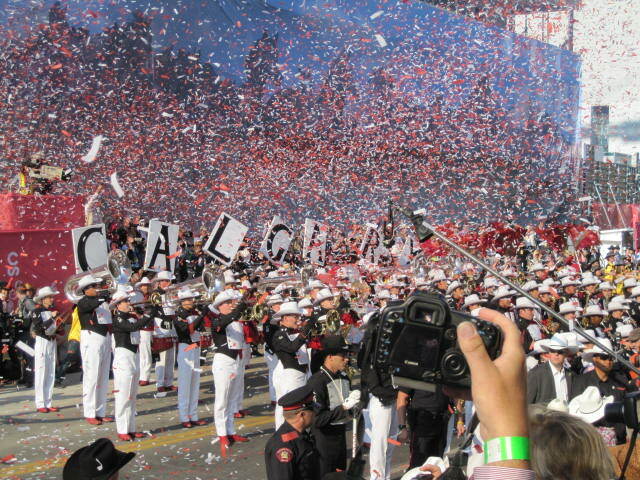 The Showband performs all over the world on a year-round basis, and makes more than 100 appearances at the Stampede alone. If you walk the Grounds for a few hours, you’re bound to run into them along the way. When getting dressed to attend the Stampede, don’t forget to put on cowboy boots, a cowboy hat, and jeans. If you aren’t dressed Western, you will stick out like a sore thumb. Trust me on this one. 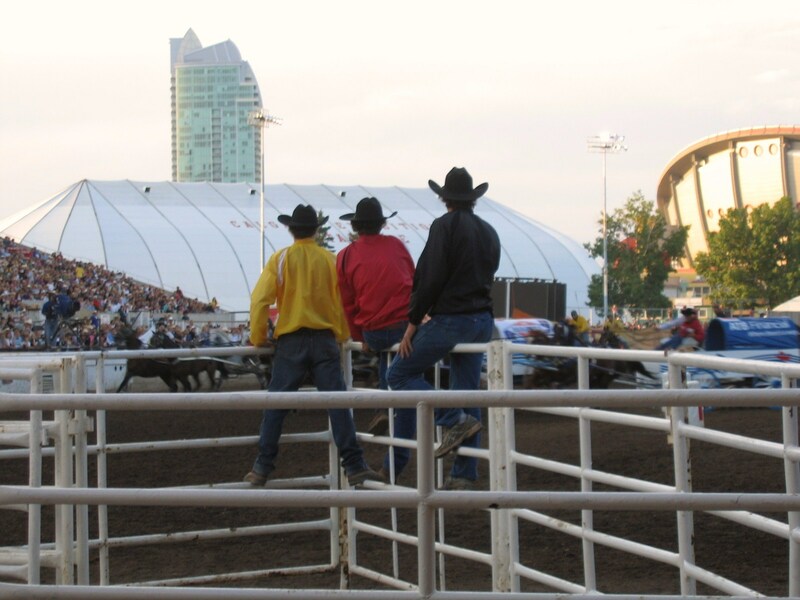 The chuckwagon races take place every evening, and are followed by the Grandstand Show. The event begins at 7:45 pm. 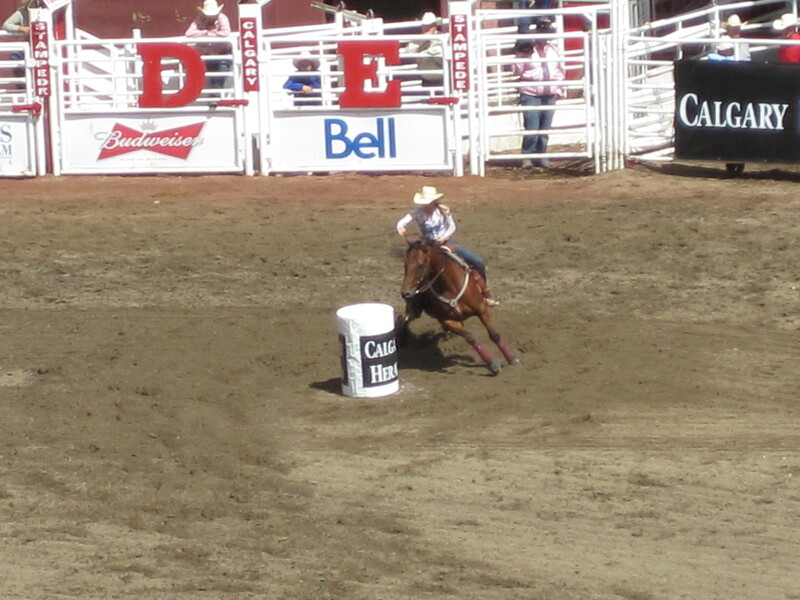 For corporate Calgary, Stampede consists of 10 days of public relations parties and client meetings that run from early morning to well after midnight. It’s one of the most important times of year for business development and corporate relationship maintenance. If you’re looking for a break from the crowds, the Stampede’s best kept secret retreat is the wine bar within the Western Oasis. But please don’t tell anyone and spoil it for those of us in the know! Many Calgarians meet their future spouses at the Stampede…including yours truly!